Our Wandsworth Nursery is Now Open and taking enrolments. Your baby is surrounded by a world full of objects and textures just waiting to be discovered. Here at London Preschool, we expose your child to new materials and encourage them to explore with their hands and their mouth. It is important to use natural materials that aren’t dangerous to your child in any way. Once your baby is old enough to sit up and hold things in their hands, it is important to give them the right objects to build on their sensory skills. A treasure basket is a great way to allow your baby to explore, experiment, and make their own choices, at their own pace. Can you have treasure basket play at home? Treasure basket play is a great activity to have both at preschool and at home. They are relatively simple and inexpensive to create and provide hours of fun and sensory stimulation. 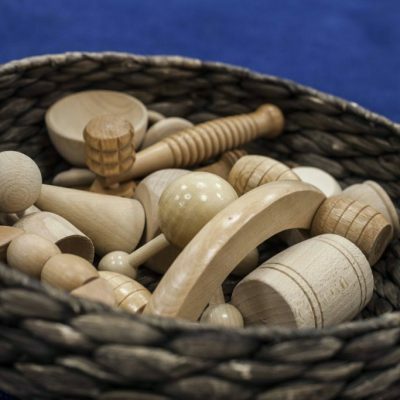 Here at The London Preschool, we ensure that our children have access to regular treasure basket play providing sensory exploration, whilst helping them to learn and develop. Why keep this learning limited to school, try creating your own treasure basket at home? Your treasure basket should be a low basket or sturdy box filled with lots of interesting and tactile household objects items. You should encourage your child to play and explore the items. You should include natural items such as paint brushes, pine cones, feathers, small pebbles and avocado stones. Creating a treasure basket for your little one can be just as fun as playing with them. Firstly, you will need to find a basket to keep all of your objects in. It should have a flat bottom and should be strong enough to stay upright, even when your baby leans on it. At London Preschool, we always advise opting for a basket that is made from natural materials rather than plastic. This way, the basket itself adds to the sensory experience. Once you have your basket, it’s time to fill it to the top with a variety of natural and everyday items. Make sure that you choose natural objects that will engage all of your baby’s senses, and avoid shop bought toys. To keep your baby engaged and constantly learning, you should change the objects in your treasure basket regularly. Always introduce new objects and textures to widen your little one’s experiences. Whilst your child is playing, make sure you pay attention and observe your baby at play. Be there whilst your child is learning and provide plenty of social contact, but without intervening in their play or guiding their experience. Treasure basket play is a great way to engage all five of your child’s senses. The activity allows your child to explore the world around them using tactile natural objects. Your baby will be exposed to a rich sensory experience through sucking, holding, touching, moving the objects about in different ways, and putting items in their mouths, which will help them to learn about the objects – their weight, size, shape, texture, sound and smell. Once you set your little one up in front of their treasure box, it can hold their attention for up to an hour or more as they explore the treats and treasures inside. It also prompts independent decision-making as they can choose the items out of the box themselves and decide when to divert their attentions to another item. What’s in your Treasure Basket? Get in touch, we’d love to hear your ideas! All the information on this website is the property of The London Preschool and should not be copied or used elsewhere.